Flies around the area of Macclesfield are a nuisance no matter what they look like or how they act. We at Macclesfield pest control offer a service to eradicate the problem quickly, professionally and at an affordable price. 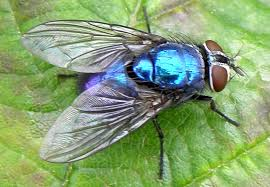 There are around 7,000 types of fly in the UK with new ones adding to the list every year. At some point we have all come across flies in some shape or form in our lives and most of them do become a nuicence, whether it a couple buzzing around in the kitchen or thousands of cluster flies in the attic and at the window panes. The fly comes from the invertebrate group of Diptera, meaning two pairs of wings. They are not just a nuinaence, many are nectar feeders and play a useful pollenating role, in the same way that bees do. Hoverflies, for example, are very numerous and colourful, and their hovering flight is a common and welcome sight in both gardens and wild places. Flies will also feed on decaying matter (either as adults or maggots) play a useful scavenging role in nature, whether they clear up dung or dead animals. And of course, flies are also food to many creatures. Some species of Diptera, however, pose major problems where man is concerned. Many families of flies are blood sucking, and while they are feeding can transmit serious disease - including yellow fever, malaria and sleeping sickness. True flies undergo complete metamorphosis - that is, they have egg, larva, pupa and adult stages. Their larvae can be distinguished from those of other orders by virtue of the fact that they are legless, though sometimes they may have small stumps or false legs. They move by simply wriggling about. Sometimes dipterous larvae are born well developed, rather than being laid as eggs - this is know as ovivipary as the egs stay within the female until they hatch and then the larvae are then 'laid'. In some flies (e.g. Tsetse flies) the larvae are full grown and ready to pupate when they are laid. This type of fly is usually attracted to dead matter such as a bird or animal within your property. Sometimes it can be food debris or other waste left behind by humans. Control is conducted by finding the source, removing it and then cleansing the area. After this an insecticidal spray will be used to kill the flies and eggs. These are found in the spring trying to leave a building or in autumn when they're trying to get back in. This I because their lifecycle is very routine, meaning you will get the problem every 6 months until the problem has been treated. They named after the way come together to breed or hibernate. They resemble the common house fly but are slightly smaller and much slower in flight. 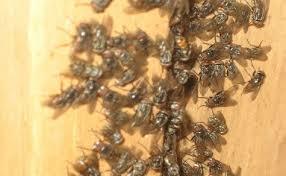 They are approximatly 6-10mm long and their thorax is dark grey to olive in colour. Control and management will depend on when the infestation is to be treated and the location of the clusters. It will usually involve a wet residual spray in conjunction with maybe a fogging to kill the swarming flies. One treatment may not always get rid of the problem as we never know if some of the flies have left to restart the lifecycle or already gone into hiding to start their hibernation.